A small fire on the Metrorail tracks near Arlington's Court House Station led to smoke in the station -- and a brief evacuation. The fire, at about 2 p.m. Wednesday, affected an insulator on the track between the Court House Station and the Rosslyn station, Arlington fire officials tweeted. The Court House station was evacuated for more than an hour, reported News4's Chris Gordon. Fire crews from Arlington, Falls Church and the Metropolitan Washington Airports Authority responded. Metro tweeted that the fire department activity had led to single tracking between Clarendon and Foggy Bottom. Update: Confirmed small fire on the track closer to Courthouse Metro, being extinguished now. Rosslyn station is clear of smoke. "When we arrived we found that Metro personnel had already extinguished the fire with an extinguisher," said Lt. Sarah Marchegiani of the Arlington County Fire Department. "We went down to confirm that power was shut down to the third rail. There was light smoke conditions in the station, so we closed the station to pedestrian traffic. There were still trains single-tracking through the station but not letting people get off." Metro established shuttle bus service around the closure. Smoke and even small fires in Metro tunnels are common, but in January a particularly smoky fire near the L'Enfant Plaza station led to the death of a woman on a Metro train from smoke inhalation. 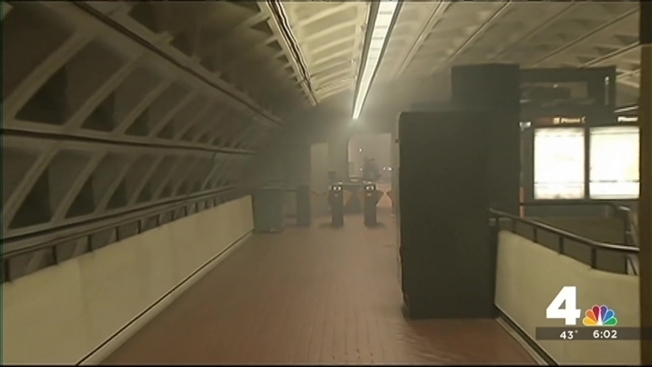 Wednesday, the National Transportation Safety Board sent Metro urgent safety recommendations about the ventilation of smoke in the tunnels. An NTSB investigator went to the Court House station Wednesday afternoon.